Today's dress has been featured on the blog before (a little over a year ago), but the jacket is a newer addition to my closet. The jacket reminds me of Jackson Pollock painting. 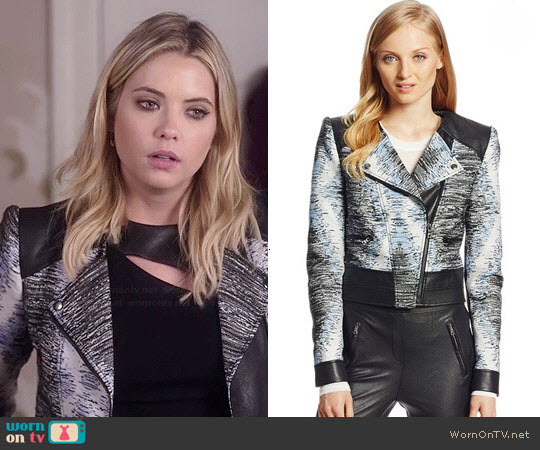 Hanna wore a similar BCBGMaxAzria jacket on Pretty Little Liars in Season 5! This is a GREAT LOOK !!!!!! Tell me about the fit of this Luis Moto Faux Leather Jacket. What size are you wearing in the photo you posted on this blog? I'm wearing a size small. It's a good fit.